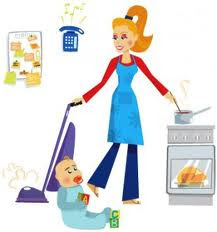 So this is my first week EVER of being an official stay-at-home wife/mom. It’s very exciting! I love being able to just do things around the house and not worry about keeping a schedule and such. But I am definitely not one to sit around and waste time. I keep just as busy being home because I don’t like to feel lazy. Except sometimes I try to do too much (surprise, surprise) and today I started feeling bad and had to lay down. I talked to Kyle on the phone at lunch and he was like, “Steph, you don’t have to run around the house all day long, you need to rest too!” Ha, ha. It’s just hard! I did get a lot accomplished today. One thing I’m doing is making freezer meals so that when I have Abigail I won’t have to worry too much about what to prepare or taking too much time to prepare things at first. I don’t want us to resort to eating out and I don’t want that burden on Kyle cause he has enough work to do. He’s not even home and has been working for 12 hours so far. Anyways, I bought homemade French Bread and made my garlic bread for 4 future meals and just wrapped them in foil. All I have to do is pull it out, let it defrost, and throw it in the oven. It’s just like buying the boxes at the store except without preservatives and added fat! I also made lasagna, spaghetti sauce, and vegetable spaghetti sauce thing for lunches for me. I put those in individual freezer bags and will heat up noodles…it’ll be like a frozen dinner. I have more things to make but that’s what I did today. I am so thankful to the Lord for allowing me to fulfill my dream of staying home to take care of my family. He has blessed me beyond comprehension. 6 years ago I had just met Kyle and had butterflies were in my stomach wondering what would happen with this cute guy. Now I’m his wife of over 3 years and pregnant with his daughter. I know it was all God and through prayer and His grace, He has made this all possible. Delight yourself also in the LORD,And He shall give you the desires of your heart.